It is described as Mda’s ‘most powerful work yet’. Click here for more about the book! The eye-catching cover was designed by Gretchen van der Byl, who has designed the covers for many South African novels over the last few years, including Siphiwe Gloria Ndlovu’s recent debut novel The Theory of Flight, Claire Robertson’s Under Glass and Zakes Mda’s Barry Ronge Fiction Prize-winning novel Little Suns. The Zulus of New York will be available in March 2019. A recipient of the Order of Ikhamanga, Mda was born in the Eastern Cape in 1948. He is the author of the famous novels Ways of Dying and The Heart of Redness, among many others, and his work has been translated into 20 languages. He spent his early childhood in Soweto, and finished his school education in Lesotho, where he joined his father in exile. Mda has studied and worked in South Africa, Lesotho, the United Kingdom, and the United States, and is a prolific writer, not only of novels, but also of plays, poems, and articles for academic journals and newspapers. His creative work includes paintings, and theatre and film productions. He is based in Athens, Ohio, in the United States, where he spends his time writing and teaching. 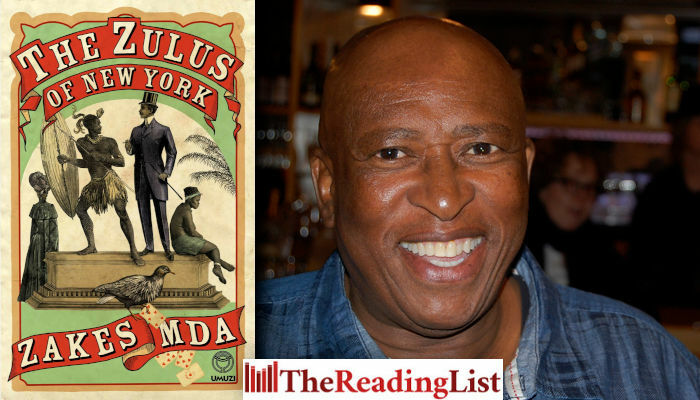 We're delighted to reveal the cover of @ZakesMda’s new novel THE ZULUS OF NEW YORK, designed by Gretchen van der Byl. The book draws on the true history of ‘Farini’s Friendly Zulus’, a group of men brought to Britain and America as performing curiosities.